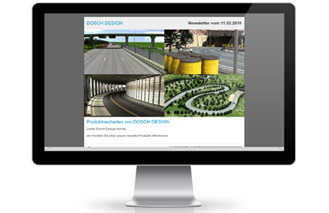 Subscribe to the DOSCH DESIGN newsletter - and receive information about the latest product releases. Consent procedures: In order to include you in our newsletter mailing list, we need a confirmation that you are the owner of the given email address and that you agree to receive the newsletter. Use of the data: The data collected are only for sending the newsletter and the documentation of your consent. There is no other processing or passing on to third parties. Withdrawal: You can revoke the newsletter and your consent to the storage of the data at any time.